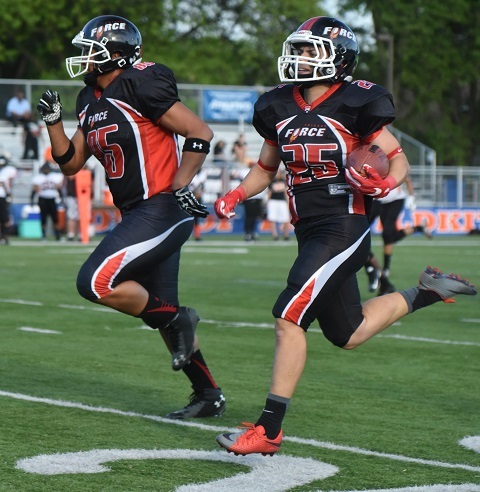 EVANSTON, IL: The weather was a balmy 84 degrees at kickoff for the last regular season game for the Chicago Force. Chicago entered the game as the 2nd ranked team in the country and St. Louis was ranked #8. With playoffs starting next week this was an important win for Chicago to ensure they retained their #2 ranking and with it, a first round playoff bye. Both teams started slowly with Chicago scoring first late in the 1st quarter on a 32 yard field goal by Jules Harshbarger. The Slam answered with a field goal of their own on their next possession to tie the game at 3-3 at the start of the 2nd quarter. After an exchange of possessions, the Slam punted and returner Cassey Brick got hemmed in on the opposite sideline by the kick coverage. When she reversed field she picked up several blocks, including a devastating de-cleater from Carolyn Lee that opened up a lane for Brick to make it into the end zone for a 75 yard touchdown and a 10-3 lead. The play was a turning point in the game and seemed to awaken a sluggish Chicago squad. 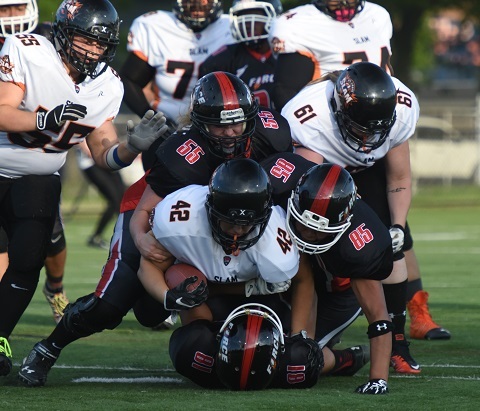 St. Louis was able to move the ball down the field on their next possession but at the 2 yard line running back Taylor Hay was crushed by Sonja Drangsholt at the line of scrimmage and Hay fumbled away what would be her offense’s best hope to score. Lee dove onto the loose ball to recover for Chicago at their own 6 yard line with a few minutes left in the half. If not for Hay’s fumble, St Louis might have been able to tie the game and give her team some hope. Instead, Force quarterback Sami Grisafe quickly moved Chicago the length of the field, connecting with Emma Vanderheyden on a key 36 yard completion to the 19 yard line with 14 seconds left in the half. After a pass interference penalty put the ball at the 2 yard line Grisafe found Jeanette Gray in the end zone for a touchdown on a perfectly thrown pass. Harshbarger converted the PAT and Chicago took a 17-3 lead into halftime. 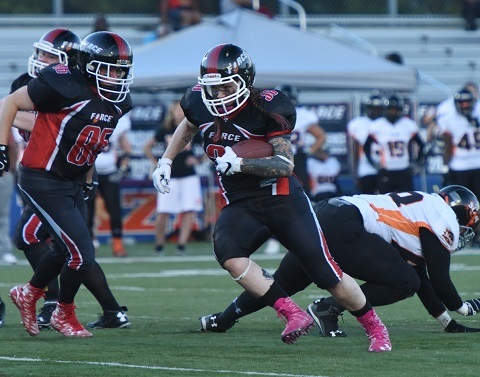 Chicago received the 2nd half kickoff and moved easily down the field, with running back Kristy Moran scoring on a 2 yard carry. The Force proceeded to score on their next three possessions as well. Moran would finish with 3 rushing TD’s (all in the second half) and was awarded the Offensive MVP award for the game. Tamika Robinson had an electrifying 30 yard TD reception and Aleksandra Lukasiewicz had a strong game carrying 8 times for 50 yards. Despite several dropped passes, Grisafe persevered and continued her strong play with 23 completions in 30 attempts for 203 yards and 2 passing TD’s. Chicago’s kickoff team gave up two consecutive return TD’s late in the 4 th quarter to make the score seem closer than the game actually was. The Slam struggled against Chicago’s defense for most of the game and was never able to reach the end zone. Kelsey Casey was named the Defensive MVP for her team-leading 8 tackles. Lee and Drangsholt also played extremely well on the defensive side of the ball. Head Coach John Konecki acknowledged the importance of upcoming practices with the playoffs looming. 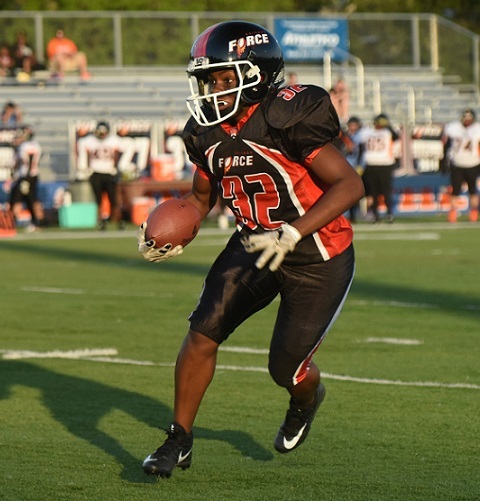 "The first season is over and we need to clean up our play if we want to be one of the final two teams left in the WFA playoffs. There is a tremendous opportunity for growth for the team over the next couple of weeks and if we apply ourselves we will make significant strides." Chicago (7-1) has a bye for the first round of playoffs next weekend and will host the second round of playoffs on June 17th. The most likely opponent will be #3 seeded Pittsburgh Passion who host #6 Atlanta in the first round. Kickoff is at 6pm at Evanston Township High School.